Doing another playthrough of Mass Effect trilogy? Now you're playing through ME 3, but forgot that one thing you always liked doing! There are many things in ME that will be slightly different depending on what Shepard has done / heard / seen. -> Mordin will sing again in ME 3 atop the Shroud on Tuchanka. -> Mordin will instead say: "Genophage cured. Krogan free. A new beginning... for all of us." Fear not. 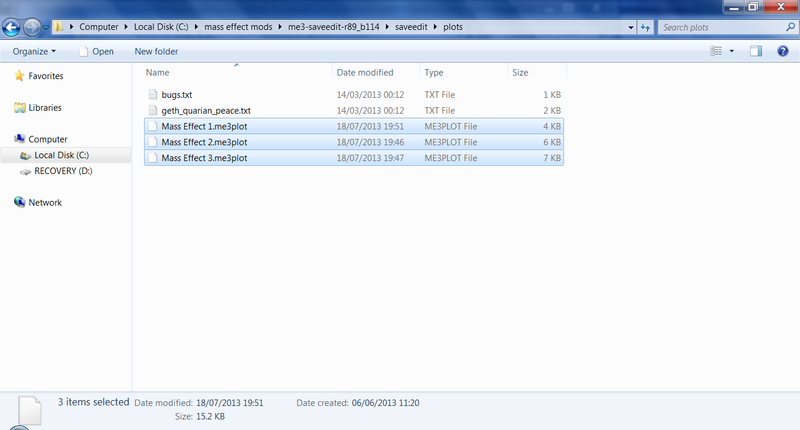 Gibbed's ME 3 save editor to the rescue. All of these can be applied manually under plot -> manual, but it gets fairly tedious to do so every time you're doing a new playthrough. 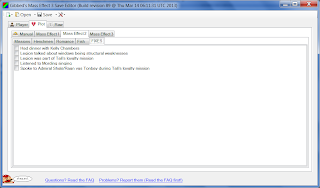 I will show you how to add these plotid's so that you get a list of checkboxes inside Gibbed's. 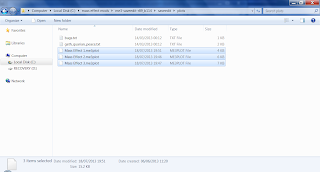 The 3 files highlighted above are the ones we want. You could add your plotid's into one of them, but I like to keep mine inline with which ever game they occur in. 3. 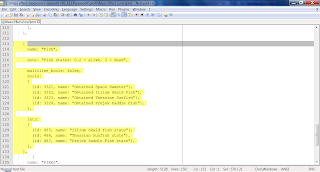 Open the above file in a text editor of your choice. 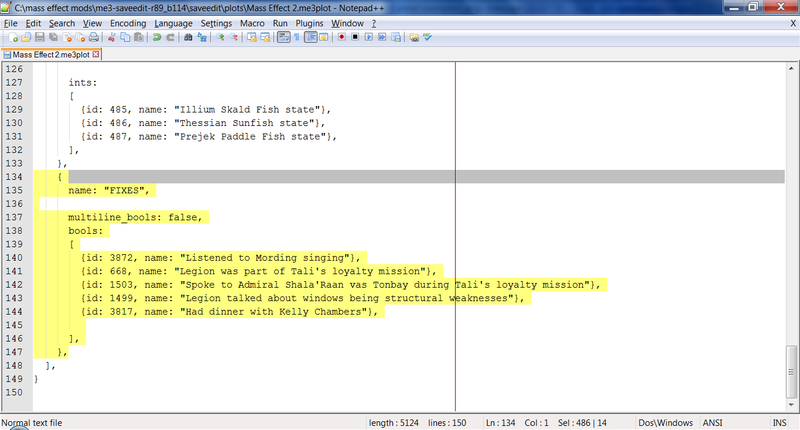 Notepad++ is what I would recommend. 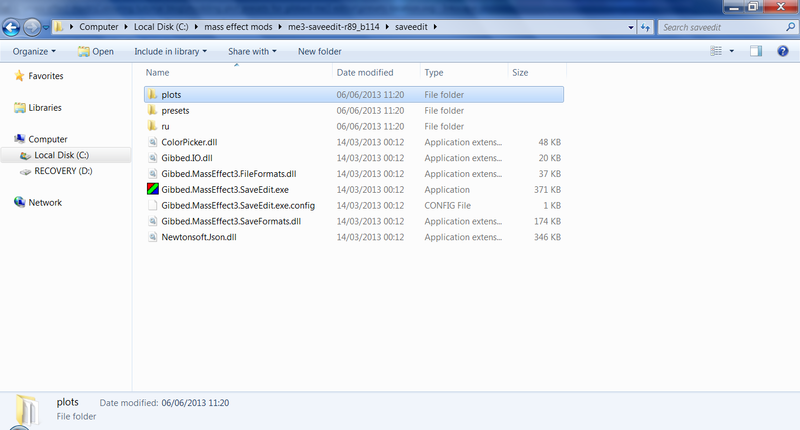 Any program that lets you store this file as plaintext will do. These are Gibbed's options for Fish that you can aquire in ME 2. We are going to take this and add a new section below called FIXES. You can name it whatever you want, I just use this so it's properly visible. Always make sure that all the braces, colons, decimals are in their correct locations and that the braces all line up. "name" - the top one - will name the tab you'll see in Gibbed's editor, and in this example it will be next to Fish. "multiline_bools" - If set to true Gibbed will break your text after a couple of words, ie no multiple lines text. I like longer explanations for each option therefore I keep this false. 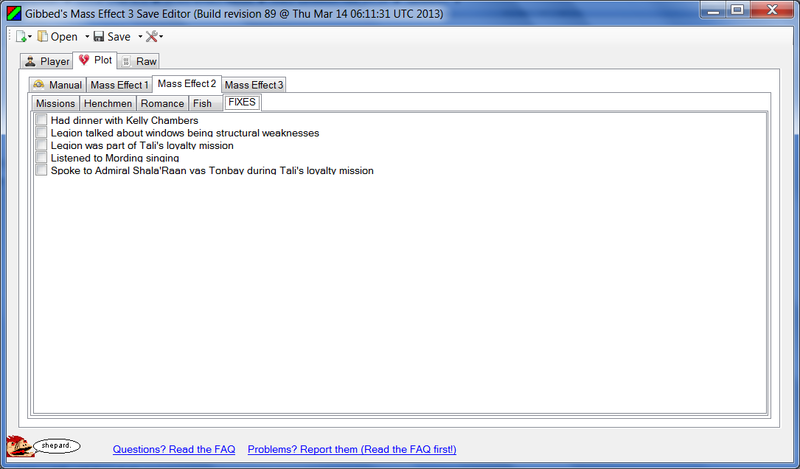 "bools" - This contains a list of all the plotid's that you want to show up as checkboxes in Gibbed. "id" - The number used to identify a specific boolean option by the game. To add a plotid to the list just copy one already listed and make sure that all the braces and dots are all in the right place. Then change the id number to whichever you want and give it a nice simple description. 6. Select whichever options you want, usually this has to be done before starting a mission where this character / event occurs in ME 3. Otherwise the game will use the default choice. 6a. If you just started a new playthrough of ME 3, and you're standing on Earth after the intro. 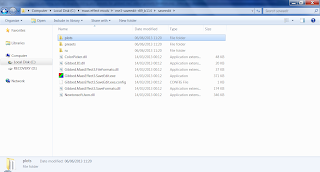 You should have a savefile called "Chapter" which you can load and edit normally. Then reload it and the intro should play with your changes. I know some people who played the game and Admiral Anderson didn't "remember" that Shepard did the Arrival dlc, using Gibbed's editor should fix this issue for you. 8. Google search and the ME 3 forums are your best place to find more plotid's. 4. Plot -> Bool variables, int variables, float variables. These are all the ones that are listed in the save editor. They are a bunch of id numbers, if you want to know what they do, then you have to do it by trial and error, or try googling to see if someone already has found what the numbers do.